All payments are taken using either Paypal or Stripe. 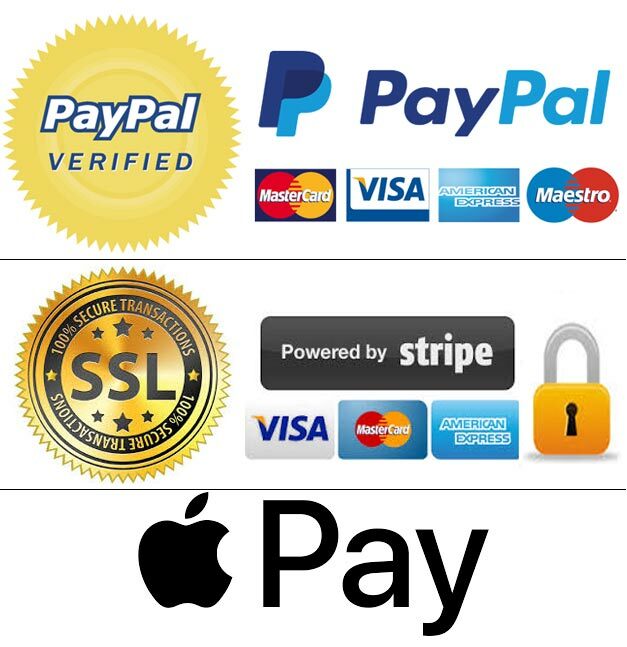 These are both very well established secure payment processors. You don’t need an account to pay with either Paypal or Stripe and both take nearly all credit/debit cards. I don’t have any access to your card details as payments are made directly to Paypal or Stripe on their secure servers. Any items that arrive damaged may be returned for a full refund or replacement. If this happens, please contact me with the details of the damage. It will help to see a photo of the damaged item and the packaging. Please refuse delivery if the item or packaging appears damaged on arrival. If you think the product you receive looks different to that displayed on the website, please contact me with a brief description of the difference. I’ll then organise a ‘corrected’ replacement. All my Prints/Canvases are custom printed to order, i do not have ‘stock’ of any images/products. With the large variety of frames and sizes that i offer, keeping a stock of any image is impractical. Under UK law ‘custom made’ or ‘made to order’ products are exempt from the internet distance selling rules. So, i don’t accept refunds/returns if you’ve changed your mind. So please ensure you order the right size/options to fit your room & space. To help you pick the right product i offer a Mock Up service – If you’d like to get an idea of what the image would look like hanging on your wall, please email me a photo (jpg) of the place you’re thinking of putting the image. I’ll then Photoshop the Canvas or Framed print into your room.